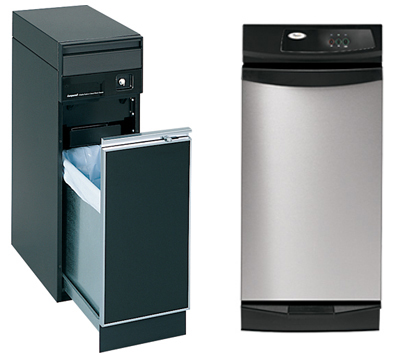 1-877-Appliance specializes in all brands of trash compactors, Call 1-877-277-5426 now and save 10% on fast, reliable, professional repair. A trash compactor has basically three components: A trash container at the bottom of the unit; a flat, steel ram in the top of the unit that flattens the trash; and a motor that can be located either at the top or bottom of the unit depending on the model. If the trash compactor is not working, first check electrical sources: Does the wall socket work when something else is plugged in? If the compactor is plugged into a “ground fault interrupter” socket you may need to press the reset button if it’s popped-out. If the power source is working and the compactor still does not function, the problem may be with the door switch, key switch, or the micro switches that sense when the ram is fully up. Make sure nothing is caught behind the drawer—keeping it from closing all the way. If the ram is stuck in an up or down position, there may be a broken drive belt, chain, gear, or switch. 1-877-Appliance service can help. Consumers troubleshoot more complex problems. Over time, spills and garbage can clog the track the drawer rides on. If the drawer can be removed, clean the tracks, glides, and rollers using a degreaser and dish detergent on a damp rag. Wipe all the components with a clean damp rag and lightly oil the track with a household lubricant. If the drawer continues to be stiff, replace the rollers, ball-bearings, and/or tracks.